Free city parking is available in front of Melange on Main Street. There is also free parking behind the restaurant on State Street, and a parking garage on State Street that is free for the first 3 hours. Feel free to enter through our back door. 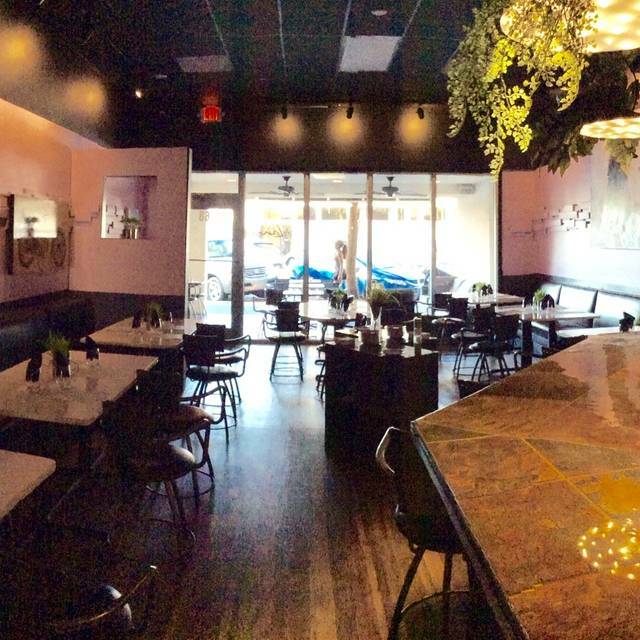 Melange is Sarasota’s most creative restaurant. We are constantly experimenting with ingredients and flavors to bring you an unrivaled culinary experience in a relaxed modern atmosphere. Very imaginative food, beautifully prepared, and excellent, knowledgeable wait staff. Astonishingly good--- the food and service and atmosphere were perfect for a holiday meal out. Excellent service and the food was delicious. The Mother of Dragon egg was unusual and yummy. Splendid service. Very interesting food and drinks. I highly recommend the recommended pairings. This is one of Sarasota's better restaurants. We were shocked at how few diners there were on a Friday evening. The food is excellent - try the duck brie crepes. Portions are not large, so start with one of the plates for the table. Service is pleasant, dishes come a bit slowly, as they aren't mass-produced. We highly recommend Melange. Our were delicious. All of which featured interesting flavors and ingredients. We ordered six dishes and shared them amongst four diners...tasting menu , of sorts. Outstanding small plate food. Had cheese tray with lovely mix of cheeses... favorite was house made mozzarella stuffed with chevre. I had perfectly prepared sweetbreads: airy and sweet, with pleasant crunch. My wife had a salad. Followed by the menu corvina and special cobia. The cobia was nice, but the corvina was perfect. Very sweet and prepared medium rare. Wine selection was limited, but all were very tasty and well priced. We found the food very inventive and well presented. My home made fettuccine was inedible. Not hot, over cooked. The roasted tomatoes stuffed with bacon were delicious. Great duck crepes with Brie and paella. Melange was a pleasant surprise. Great ambiance. Low noise level. Attentive service. Unique menu. Great tasting food! Congrats to Chef and staff for a wonderful dining experience. We will be returning for another great dining experience. I can't believe it took me so long to try Melange. My friends and I all loved it. I started with the Green Fairy cocktail (sparkling wine and absinthe) which was refreshing and unusual as well as delicious. The bisque soup was lovely if a bit too salty for my palate. 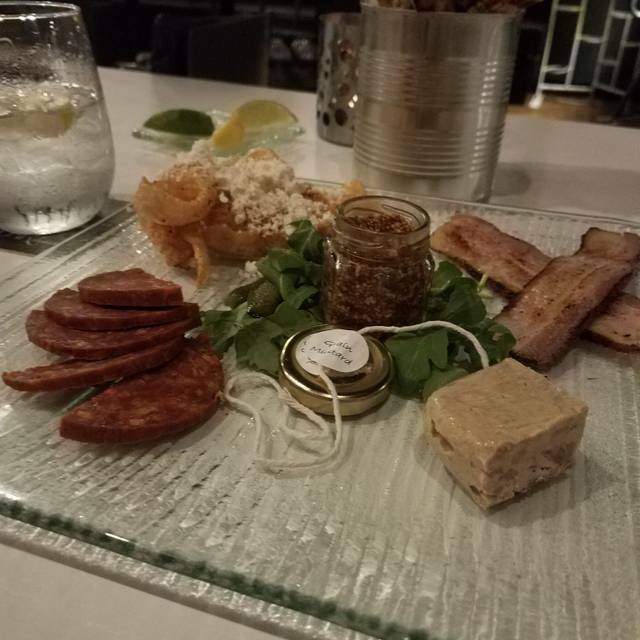 The foie gras platter was served cold and had an very interesting coffee syrup garnish. My friend ordered the chicken and waffles and pronounced them delicious. My friends ordered the New Zealand Sauvingon Blanc which at $8 for a generous glass was quite amazing. All in all it was a great dinner and I have already made plans to return with some other friends. NOTE: Melange is one of the only downtown restaurants to serve late, so it's also perfect for after the movies, theater, opera or whatever. Very creative menu. Best food for the price. The waitress was wonderful. The food delicious. My only constructive feedback is the ambience was depressing. It was dark and not very appealing . For a restaurant that has lovely food in an interesting way to present , I was very surprised of the inside of the restaurant. The food was amazing. Absolutely delicious. The wait staf delightful and attentive. Worth a trip there. We took guests there this past Saturday evening. We asked for a table in the bar as the set up there is much quieter than in the main dining room. We shared three appetizers and each had their own entree. Service and food were excellent. This restaurant is clearly one of the best in Sarasota. The third time I have been to Melange. In French, "Melange" means a combination of things: in this case, the dishes are indeed a melange. My experience has been the combinations have been very good and very well presented. The staff is pleasant and I like the wine pairing approach. Our dinner was outstanding! We decided to try this based on opentable reviews and I can’t agree more that the thought process into each dish is so creative...the contrast of flavors and ingredients rivals any fine dining, “foodie” experience ever! We can’t wait to go back. Great service from Brad - very knowledgeable and paced our dishes perfectly for a fantastic culinary evening. This was our first time at Melange, and we were very impressed with the food (excellent choices for vegetarians and meat lovers alike) and beautiful presentations. Our server, Brad, was attentive, personable and very knowledgeable when we had questions about the menu. We thoroughly enjoyed our dinner and will return. Melange should be on everyone's short list of best Sarasota restaurants. This past Saturday my wife had Corvina and I had the duck crepes. Both were outstanding. Service is always very friendly. The servers know the menu well and are attentive. The restaurant is set up so that noisy guests are not overly disruptive to others. This past visit we had a table for two right next to a table for eight and we were not uncomfortable. Most inventive menu in Sarasota! Have always enjoyed an excellent experience. The men’s and woman’s restrooms were in terrible condition. Very dirty and poorly maintained. Was concerned that other aspects of the restaurant were similarly poorly maintained. We arrived at our reserved time, 6:30 PM, and were surprised to find we were alone in the restaurant! In response to our inquiry, the server told us that every table would be filled by 8:00, and we subsequently found she was correct. Service was casual, but reasonable. Being seniors, we like a cocktail before dinner and found they didn't quite know what to do with two scotch orders. We said the bar scotch would be fine, but it turned out that they didn't have what they would call a bar scotch. We told the bartender to chose for us, and she chose Pig Face! It turned out to be excellent. My wife had duck crepes and I had beef short ribs. Both were wonderful. The serving sizes were just right and the sides were cooked right. For desert we had cheesecake and no flour chocolate cake. Both were excellent. The service was good and so was the food. I liked the extra touches they did for presentation. The drinks look amazing as did the desserts, neither of which I was able to try but we look forward to going back. The restaurant was fully when we left but never got too loud. I’d definitely recommend this restaurant as a great Main Street option. There was no one in the restaurant when we arrived at 6 pm- their opening time, however by the time we left the place was filling up. Very interesting menu- we enjoyed the duck spring rolls to start- generous serving with 6 pieces to share.. the other dishes were generous for tapas. The duck brie crepes were yummy, as were the beef short ribs- tender and juicy. We also ordered the seafood paella- more food than we (party of 2) could eat but we enjoyed it the next day. Only negative is that when we arrived, there was a stinky smell- maybe because the place had been closed all day long- and after a while we couldn't smell it any more- but maybe they should air it out before opening to avoid that smell as the first impression. Overall, we enjoyed our meal and plan to return. Excellent experience! Food was incredible as were the custom drinks! Terrific small plates, very creative menu. Visited on Valentine's Day, so service was very slow. Servers were good, but clearly overmatched by the crowd. What a gem. We focused on the specials knowing we would be coming back soon for the items that are standards, which also looked very interesting. Everything was perfectly prepared: food and cocktails. A real foodie find hiding right in plain sight! Small portions of delicious and interesting dishes. And excellent wine choices. A little dress up with table cloths would make it all elegant. Amazing meal. We had the fish appetizer, which was enough for four. Then we each had an entree. Then split two desserts for the table. Everything was wonderful and the service (Michele) was great. Our two servers were pleasant and tried to do their best under trying circumstances. Our appetizers took 45 minutes to arrive and the entrees another half hour. We learned later that the chef didn't show up for work. There was only one person taking food orders and delivering the food with the other taking drink orders and attending to the bar area. We asked the server to comp us a glass of wine due to the delays. She told us she could offer a shared dessert which we declined--we just didn't have another 30 minute wait in us. The appetizer, duck spring rolls, was OK, not great. The duck crepes were quite good. The paella was overcooked and dry. The atmosphere is pleasant enough but, given the restaurant's management issues, we will not return. Food was delicious. Kitchen was slow getting out our entrees . Overall a very nice dinner. It's a welcoming atmosphere and a very interesting menu different things beautifully presented the food was absolutely delicious. I plan on visiting often. Excellent food, a bit elegant (foie gras-3ways), a bit unusual-(rabbit tacos) and mostly delicious! Madeleine was a great waitress and even the chefs were friendly. Melange is always a fantastic option. They have a wide range of dishes, and the prices are incredibly low (given the quality of the food). Absolutely wonderful!! From the first drink to the last cup of coffee!! The foie gras board and seafood board are a must. We will be back as soon!! the mushroom soup , which was one of the specials, was quite good. The other special was frozen trout?? How can a good restaurant in an abundant fresh fish area serve frozen fish? The other two dishes we tried were the duck egg rolls which were greasy, and had a very strong duck taste, and the house made pasta which was a heaping mush of tasteless gluten.